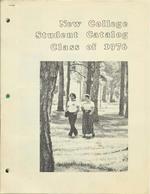 Seventeen page student catalog featuring photographs of students who were entering their first year at New College. , BARBARA SUE ABELS Shaker Heights, OH Case Western Reserve Univ. LAUREL E. ANDERSON Hyannis Port, MA Barnstable H.S. CAROLINE ANN ARntUR Baltimore, MD Western H.S. CHARLES SCOTT BAKER Bi nni ngham, AL Berry H.S. ... GREGORY D. BAYER Oil City, PA Uni v. of Notre Dame KIRSTEN ANN BENGTSON St. Paul, MN Univ. of Minnesota LYNN ANNE BENTSON Seattle, WA Shorecrest H.S. RONALD LEIGH BERGWERK Map 1 ewood, NJ Newark Acaderqy -1-GEORGE HARLEY BLOSSER Kansas Ci ty, MO Ruskin H.S. LISA ANNE BOURBEAU Barnstable, MA Univ. of Massachusetts LAURA ILENE BRAUNSTEIN Allentown, PA William Allen H.S. MINDY SUE BRONSTEIN Philadelphii, PA George Washington H.S. ARON ZALf-tAN EDI DIN Evans ton, I L Evanston Township H.S. ANDREW DALE ESTES Tucker, GA Tucker H.S. WILLIAM J. FARDY East Weymouth, MA Weymouth North H.S. MONTGOMERY KIM FISHER South Windham. ME Hinckley School NANCY KAY FLEISCHAUER Pittsburgh, PA Ri ve rvi ew H S EUGENIA FLOYD Hartsville, SC Hartsville H. S. CAROL LYNN FOSTER Hunts ville AL Grissom Schoo 1 JAMES ERIC FOSTER Hollywood, Fl Nova H.S. -4-r ... LUCY ESTHER FRANKS Plymouth, W\ Dana Hall School RUSSELL ROY GARDNER Tucker, GA Tucker H.S. ELLEN LOUISE GERMAIN Massapequa Park, NY Farmingdale H. S. BONNIE GINTIS N. Miami Beach, FL North Miami H .S. AMY BETH LEZELL Oak Park, MI Roeper City & Country Day JUAN DAVID LINDAU Villa Obregon, Mexico American School Foundation PHILIP GADDIE LOGSDON Louis ville, KY Seneca H.S. / ROGER ALAN LONGMAN Weston, CT Weston H.S. JEFFREY ALLEN LOOMIS Parma, 00 Parma H.S. l BRIAN LUKACHER York, PA William Penn H.S. WILLIAM JOSEPH McGCJ,tlAN Little Rock, AR Ca tho 1 i c H S ROBERT GERARD McGURGAN Kensington, CT Berlin H.S. -7-SAM BURR McMILLAN Silver Spring, MD Kenyon College PAMELA MARGARET McRAE Charlotte, NC Myers Park H.S. W\RK FRANCIS MacDOOALD Haddonfield, NJ Haddonfield Memorial H.S. ROBERT LINDSAY MacDONALD Penbroke, MA Silver Lake Regional H.S. STEPHEN PAUL NAMINSKY Virginia Beach, VA Kelf4ls vi 11 e H. S. LEE ELLEN NEWTON New Britain, CT New Britain H.S. WILLIAM THOMAS NORFLEET Webster Groves, MO De Smet Jesuit H.S. PATRICIA FRANCES OGILVIE Vineland, NJ Vineland H.S. HAROLD EUGENE OLIVER Albany, GA Amherst College ROBERTA LYNN OSBORN Hanover, MD A run de 1 H S JILL PARKER Phoenixville, PA Phoenixville Area H.S. -9RUTH ANNE PARLIN Bethlehem, PA Liberty H.S. MARK LEE PAYTON Tucson, AZ Palo Verde H.S. STEPHEN CHRISTOPHER PETRICA Towson, Towson H.S. CHARLES LEON PILLER Highland Park, Il Highland Park H.S. EVA MARIE PISCHNOTTE Portsmouth, VA Portsmouth Catholic H.S. LARRY CHARLES POLANSKY Valley Stream, NY Valley Stream South H.S. BRIAN EDWARD POWERS Uni ve rs i ty City, r Uni v. of Missouri REBECCA MARY POWERS Omaha, NB Westside H.S. RANDALL WINSTON PUTTICK Charlotte, NC Univ. of North Carolina PHILLIP ROBERT POTESKY, Jr. GEORGE PHILIP RENO, Jr. South Orange, NJ Gainesville, FL Columbia H.S. Univ. of Florida -10-PATRICIA EVELYN RENO Gainesville, FL Sante Fe Community College RENEE REYNOLDS Co 1 umbus !li Upper Arlington H.S. WILLIAM JEFFREY RICHMAN Maplewood, NJ Columbia H.S. THOMAS WILLIAM ROGERS Philadelphia, PA LaSalle College H.S. DAVID JAY STRULL Baltimore, MD Pikesville H.S. MARGARET LEE SYKORA Cuyahoga, OH University of Akron MICHAEL JOHN TAMMENGA Miami, FL South Miami H.S. ETSWIRO TAMURA Tokyo, Japan School of the English Lang. KAZUY 0 TANAKA Tokyo, Japan Schoo 1 of the English Lana. JANICE TAYLOR APO, New York St. John's College STEVEN MICHAEL THOMAS Hazelwood, MO Hazelwood H.S. PRASHANT TI f>BLO Margao, Goa, India Smt. Chowgule College -13MARY LORAINE TIRRELL Belvidere, NJ National College of Ed. CRAIG LOREN TUCKER Houston, TX Clear Lake H.S. ERICA AMS TEL Rio de Janeiro, Brazil Escola Amer. Rio de Janeir1 CATHY LEE WALLACH Matawan, NJ Regional H.S. ROBERT t .1ERW IN WATTS, Jr. Broad Brook, CT Watkinson School CAROL PAULA WEISS Ham:fen, CT Hamden H.S. NANCY ANN FLEMING Anaheim, CA Loara H.S. PEGGY S. WELLING Trenton, NJ Stonleigh-Burnham School / EDWARD CECIL WILLARD Jeffersonville, IN Jeffersonville H.S. OUT OF ALPHABETICAL ORDER RENEE ELLEN FREEDMAN Manchester, NH Manchester H.S. Central -14WENDY JUNE ZELAZNY Indialantic, FL Melboume H.S. PENNY ANN ZALETA FL Eau Gallie H.S. CAROL ANNE HALL Dayton, OH Oakwood H. S.